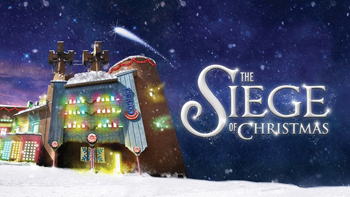 The Siege of Christmas? You mean, someone is holding Christmas hostage? Well, sort of, yes. Not Christmas per se, but The Spirit of Christmas; the essence that makes everyone merry and puts us all in a good mood at this festive time, that has been stolen and is locked away in a secret location somewhere inside the Contact Theatre building, which has just as I am typing been taken over by an angry mob of Mince Pies! The mince pies have thrown us all out of the building and barricaded the door. They are protesting because they never get properly cooked in the oven, and are always undecorated; and so they are helping the thief and have thrown us out! Even Dan, our friendly Front of House Manager, has been thrown out of the theatre too and has no idea what to do now. He has a group of angry and disappointed theatre-goers expecting to see a play called The Siege of Christmas and we are all locked outside in the cold! Fear not, for all this is part of the play of course, and the children, of which there are quite a few, are still trying to take this in, when suddenly, enter Nutcracker; a secret agent who has been assigned and working under cover to restore order, recapture and release The Spirit of Christmas once again. Of course she needs help - from us; and so we become her army of helpers as she guides us back into the theatre building by a rear entrance and a strategically placed snow machine! We travel from area to area and in each space there is a short play for the children to become involved in the story. Elves are disgruntled because they are always working and never get to see daylight and therefore no longer care. They have lost the spirit of Christmas too. A rather hot and bothered snowlady, or whatever the name for a female snowman is, a Christmas Cracker and some life-size toys all too have lost The Spirit of Christmas because they too have been overlooked, passed by and ignored. We also meet 4 fairies who have turned to naughty and mischievous behaviour - they too are helping this master criminal. In each space there is a nice set piece and each space has been designed and dressed accordingly. The crackers in smoke was especially pleasing. The idea was excellent, and the children did enjoy it. We arrived finally at the room where The Spirit Of Christmas was being held, and we meet the 'master criminal' behind this heist. He is just a misunderstood youth who too has lost the joy of Christmas because he never has a good experience at Christmastime himself and so decided to make everyone's Christmas miserable. But everything turns out fine in the end with the gift of a Christmas jumper for him to wear, and he agrees to release the Spirit. All those characters we met along our way now come together in happiness and sing a finale song for us. The presentation, in promenade style, lasts one hour, and is the ideal time for such a show. The content is age appropriate and the young ones - recommended from age 5 upwards - certainly did enter into the spirit wholeheartedly and enjoyed the experience. For the older children, those ten or more, were not impressed at all, and could see through it all right away! It was extremely well acted and the presentation was good. However, there were a couple of things which I found a little too much and distracting. We learnt a 'Nutcracker Freeze' which would render us invisible when in times of extreme danger. A good idea, but on the occasions this command was shouted no-one knew why. There was no danger. The map was only seen and carried by one or two of the children - the rest of them didn't stand a chance of seeing this integral part of the storyline. Likewise with the present from the elves' workshop. Even I had not known and understood that the present was a Christmas jumper until it was presented in the final scene and I put two and two together! The Fairy Dust balls were not understood by the majority at all. In other words, there were too many distractions, all of which were nice ideas, but when put together diluted the story and the children's understanding. The other thing missing from this presentation was atmosphere. No-one ever felt that there was indeed any danger, and it was all too 'nice' and 'safe'. Perhaps that was deliberate because of the target audience age, but it certainly needed more in the way of genuine fear to start with at least. The other thing which didn't work in their favour was that every audience member was asked to wear headphones and a device around our necks. I simply do not understand the need for this at all. Are the actors incapable of projecting their voices? We were a small group, and were never far away from the performers. They were distracting and cumbersome, and totally unnecessary. Directed by Alan Lane, it ticked several boxes but sadly not all, and although the children on the whole did enjoy themselves, their experience could have been so much more. I am uncertain that they would have understood everything, and the final reveal - the releasing of the Spirit itself was extremely disappointing and an anti-climax. The Spirit was bottled in a see-through jar (there was a lit candle or something similar in the bottom) and when the lid was taken off the expectation was high for some fantastic effect to take place. Sadly, all that happened was that it lit the lights on a nearby Christmas Tree. Very poor! The acting was good and constant throughout. Joshua Wilkinson, making for a rather unperturbed but compliant Front of House Manager, Dan; whilst Grainne Flynn was the para-military agent Nutcracker, and engaged well with the youngsters. Other cameos were played by other members of Contact Young Company.